It was 1984 when the first Terminator was sent back to kill Sarah Connor, who would eventually birth the leader of the war against the machines in 2029—John Connor. Well, I should say it was 1984 when director James Cameron told us this story in his iconic picture, The Terminator. Seven years later, Cameron would tell a story of a more deadly cyborg sent to kill John Connor in Terminator 2: Judgment Day. That sequel remains to this day, one of the greatest action, sci-fi films ever made. 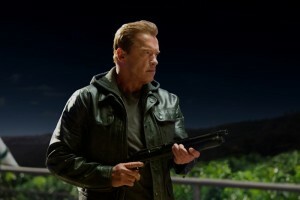 Since then, the Terminator franchise created two more sequels, games, and television shows. Well, that is until now since director Alan Taylor is bringing the world the fifth installment in the franchise called Terminator Genisys. Terminator Genisys follows Kyle Reese (Jai Courtney), who is sent back in time by John Connor (Jason Clarke) to protect Sarah Connor, only to find out that nothing is as he expected it to be. Terminator Genisys is the kind of picture that leaves me on the fence. There are good things and bad, leaving me in the middle instead of defending or prosecuting it. I will say this movie exceeded my expectations as I thought it was going to fail miserably. Instead, I found myself enjoying the majority of the film but having a couple issues along the way. I, more or less, enjoyed this movie. I thought it was an adequate sequel, but a sequel nonetheless. It is hard to make a great picture when you are following some of the greatest action, science fiction films of all-time. It also helps that the first thirty minutes of this film are recreating the beginning of The Terminator. Watching the how well they recreated these moments are truly magical, however when Genisys begins to wonder into its own story is when the movie goes a little downhill. This movie creates an alternate timeline. So this movie erases the previous installations, Terminator 3: Rise of the Machines and Terminator Salvation, along with everything else that we know from the Terminator franchise. Everything that we know changes, but the problem with this is that the single most important event that causes this huge change happens off screen. This one event changes the entire future, and it is shown briefly in flashbacks and told with dialogue, which didn’t sit right with me. However, it is the perfect opportunity for them to create a whole new trilogy based off the new timeline. As far as acting goes, Arnold is finally in his element. This is the most natural and comfortable he looks since his “return,” back in 2010. I really enjoyed the performance from the young Sarah Connor, played by Emilia Clarke though I felt her relationship with Jai Courtney felt forced. Yet, her relationship with Arnold, or she refers to him as “Pops,” was good and gave the movie some heart. Another great aspect of the Terminator Genisys was that is modified Skynet to the modern age. In this film, Skynet is actually an operating system know as Genisys. So, as Genisys is being installed in every phone, tablet, and computer we are able to see the movie’s message about today’s technology. It makes the story more relevant and closer to home. However, in the midst of all this, there is something just not clicking. It seems good on the surface but fails to give us, the audience, something to latch on to. I don’t want to say it is forgettable, but it comes close. I feel like I could go on and on about this movie, the good and the bad. Probably because Terminator Genisys left me directly in the middle. The one element that I thought was going to really make this movie special wasn’t very effective at all. Maybe because this movie decided to give away the greatest twist in the trailer. I’m talking about the John Connor thing. This wasn’t the first time this franchise gave away a major plot twist, T2’s trailer revealed Arnold was the good guy, ruining the most surprising part of the movie. Anyway, the thought that John, the leader in the war against the machine, actually becomes part machine seems like it would be an incredible direction to go. Yet, it sounds better on paper. John just becomes another villain that Sarah and company have to eliminate.